As Shakespeare once said, brevity is the soul of wit. So, let’s just cut to the chase on the chance you, dear reader, don’t make it til the end of this review. Stop what you’re doing, log onto The Goodman Theatre’s website, get a ticket…no, get several tickets, and go see Destiny of Desire before it leaves our fair city next month. I’ll give you a moment… got them? Good. Great. Please note: I am practically begging you to see this show. Destiny of Desire is a show that weaves so effortlessly the existential questions of life with drama, music, and utter hilarity. The Goodman Theatre was able to find a true gem in playwright, Karen Zacarias who returns to them with a play she refers to as “an act of rebellion, heritage and joy –as well as an aesthetic, artistic, and political endeavor”. The cast of actors assembled by The Goodman astonishes, and each one walks on stage with courage, commitment and, somehow, very straight faces. The company held no budget restraints on this Francois-Pierre Couture set that was brought to life with an ingeniously creative yet simplistic design. Director, Jose Luis Valenzuela, manages to take a wonderfully chaotic and complex plot and milks each and every moment to form a sharply witty and joyous night of entertainment. Whether it be as small as an entrance, or as large as a plot twist, there is no point that feels dry or tired in this show, despite its lengthy run time. The play is “an unapologetic telenovela. In two acts”, as the company informs us. It does well to follow the standard six-month telenovela storyline, but is fastened with live music and original songs, and is all packed into insane two hours. A telenovela is a type of serial drama that is wildly popular in Latin American and Asian countries. Six nights a week, during primetime, millions of people sit down to watch the heightened drama unfold on their screens. Often, the writers will intertwine a fast-paced plot with elements of music, and sociocultural messaging. For the most part, Zacarias takes care not to sway too far from that structure. The exception being her addition of a Brechtian performance that creates a play within a play plotline, as the actors use his techniques of titles, quotes and songs. 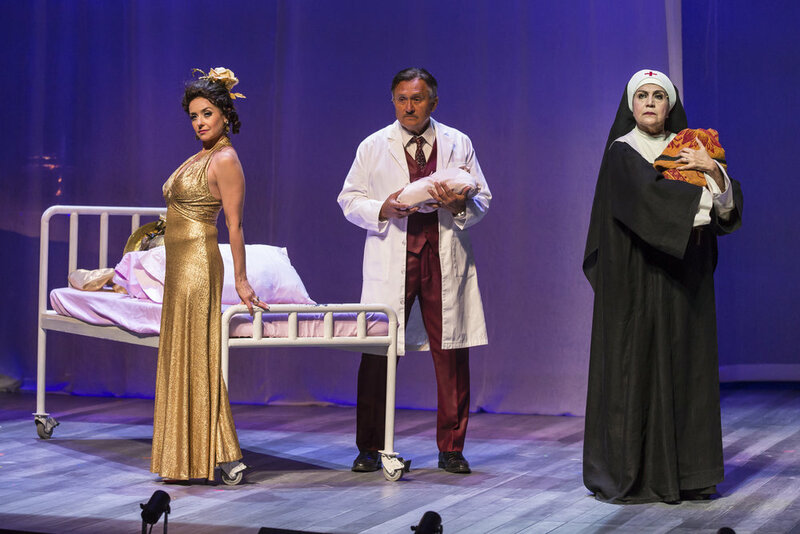 Ruth Livier (Fabiola Castillo), Ricardo Gutierrez (Dr. Jorge Mendoza) and Evelina Fernandez (Sister Sonia) in the Chicago premiere of Karen Zacarías’ Destiny of Desire. Photo by Liz Lauren. Before the show begins, the ensemble –a collective group at an abandoned Chicago theater greets the audience. It is this ensemble of actors that will become the characters of Destiny of Desire. At the start, they meander around the stage and theatre, warming up and preparing for the performance. When it is show time, an actor comes out in full costume to tell the audience to turn off their phones and unwrap their candy, then a second actor comes onstage with a large title card to introduce the first scene, “Life, Death, and Destiny”, and we’re off! What follows is the story of two baby girls, born on the same night in the desert town of Bellarica, Mexico –one to the richest family around, and the other to poor farmers on the outskirts of town. When they are deliberately swapped, the outlandish misadventures that befall everyone involved can only be described as well…destiny. Throughout the show we bear witness to women taking hold of their lives, while we’re showered with clever statistics on the socio-economic climate of our country. I can’t say much more without spoiling the plot, but beware that you are in for quite the wild ride. Fueled with love triangles, family drama, soul-searching, dancing, parties, jail and lies, there is never a dull moment in this twist-turning story. In truth, while seeing this show I had the same question I often had when I watch Chicago produced theatre: Will the right people see this? Meaning, as a show clearly geared toward a Latinx audience, would the show only be viewed by the same typical theatre crowd (read: white and of a certain age)? As is the trend in most cultural activities and events, theatre being very high on that list, the audiences generally reached are not representative of the diverse souls that dwell the Windy City streets. I had that particular feeling after the prodigal son, Sebastian Jose Castillo, sings a song comprised entirely in Spanish. I wondered if anyone felt uncomfortable, or viewed the culture as yet another thing to be appropriated. Furthermore, I desperately hoped that a show with so much Latin culture would get to be seen by Latin people. I was pleasantly surprised to see so many Latinx and non-white people in audience (a feat that I’m sure leaned itself to the Goodman’s notoriety). I was even more pleased when I learned of all the diversity initiatives being brought on by this renowned organization, as a means of incorporating and hiring all types of people. I commend them greatly for being aware, and I commend even stronger, the voices of people like Karen Zacarias, who are able to create art that speaks to a certain culture yet is able to reach everyone. Destiny of Desire runs until April 16th with accessible performances included throughout as well. Tickets can be purchased at www.goodmantheatre.org/destiny, in person at Goodman’s box office or by calling 312-443-3800. More information is available by going to www.theatreinchicago.com. Taylor Wisham has lived in the Chicagoland area long enough to consider herself a native. She attended Illinois State University and graduated in 2013 with a Bachelor of Science in Theatre…yes, Science. She was this close to completing a minor in film studies but there was a slight snafu with her ability to pass a certain gen-ed class. She’d really rather not talk about it. Since graduating, Taylor has managed to keep herself mighty busy. She is an actress in the city, a co-host of the Show Up Chicago podcast, an Artistic Associate with The Comrades, and hosts a weekly Youtube series about death and grief called The Grief Brief. She has been writing for Chicago Stage Standard on and off since 2014. Chicago Stage Standard marks Taylor’s official debut as a critic, and she could not be more thrilled at the opportunity. She has a plethora of opinions on all of the things, so she hopes you enjoy what she’s got to say!